Send in the clowns... and then run for cover! 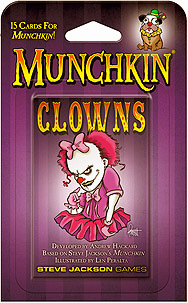 Munchkin Clowns is a 15-card expansion that brings the scariest part of the circus into your next Munchkin game. This is and expansion for Munchkin. It is not a stand-alone game. This is NOT a collectible or randomized set. Every Munchkin Clowns pack is the same as every other.